While technology stocks have found a wave of volatility but, for the most part, maintained their bullish trend, the largest pharmaceutical company in the world has been plotting along an ugly stock trend until recently -- where it has found a leg up. 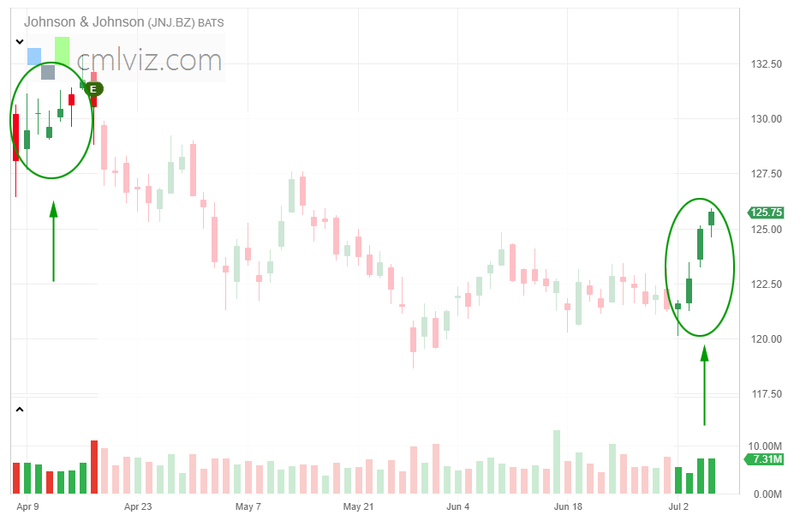 With earnings due out on 2018-07-17 before the market opens, according to our data provider Wall Street Horizon, there is a bullish momentum pattern in Johnson & Johnson (NYSE:JNJ) stock 7 calendar days before earnings, and we can focus on it right now. Seven-days before 2018-07-17 would be 2018-07-10. Here is an one-year chart for JNJ, and it's pretty ugly. We can see a new spring in the step of the stock as it approaches the next earnings event on 218-07-17, and if we look closer, we can see that same upward momentum just one quarter ago before the last earnings release, as well. We will examine the outcome of getting long a weekly out of the money (40 delta) call option in Johnson & Johnson 7-days before earnings (using calendar days) and selling the call before the earnings announcement. In English, at the close of each trading day we check to see if the long option is either up or down 40% relative to the open price. If it was, the trade was closed. The mechanics of the TradeMachine® Stock Option Backtester are that it uses end of day prices for every back-test entry and exit (every trigger). ➡ The average percent return per trade was 28.9% over each seven day period. ➡ The average percent return per winning trade was 64.9% over each seven day period. ➡ The average percent return per losing trade was -43.1% over each seven day period. We're now looking at 152.8% returns, on 3 winning trades and 1 losing trades. ➡ The average percent return per trade was 39% over each seven day period. ➡ The average percent return per winning trade was 53.6% over each seven day period. ➡ The percent return for the losing trade was -4.7% over each seven day period. Is This Just Because Of a Bull Market? It's a fair question to ask if these returns are simply a reflection of a bull market rather than a successful strategy. It turns out that this phenomenon of pre-earnings optimism also worked very well during 2007-2008, when the S&P 500 collapsed into the "Great Recession." The average return for this strategy, by stock, using the Nasdaq 100 and Dow 30 as the study group, saw a 45.3% return over those 2-years. And, of course, these are just 8 trades per stock, each lasting 7 days. * Yes. We are empirical. * Yes, you are better than the rest now that you know this. * Yes, you are powerful for it. You should read the Characteristics and Risks of Standardized Options. Trading futures and options involves the risk of loss. Please consider carefully whether futures or options are appropriate to your financial situation. Only risk capital should be used when trading futures or options. Investors could lose more than their initial investment. Past results are not necessarily indicative of future results. The risk of loss in trading can be substantial, carefully consider the inherent risks of such an investment in light of your financial condition.